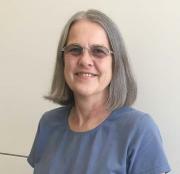 Betsy's services as a navigator include providing informtion on resources for cancer prevention, treatmet, care, survivorship, and access to clinical trials available at the University of Virginia Cancer Center and elsewhere. There are currently three active research trials offered by the UVA Cancer Center. “Moving Away From Cancer,” is a program for survivors of breast, gynecological or female colon cancers. The program uses walking for thirty minutes a day and a short exercise routine to help maintain healthy weight. It is a six month program and participants will receive free pedometers, therabands for exercising, phone support by UVA masters students in Kinesthetic Studies and gift cards. Two other studies are recruiting breast cancer survivors for phone surveys, one about accessing non-cancer related health care and the other about using phone apps for health information. In May there will be a free “quit-smoking,” trial which will include free nicotine gum or patches for the participants. If you are interested in these programs please call Betsy.